Any trip to Oz can be measured by the magic encountered on the journey, and by that scale, The Woodsman should be high up on your itinerary. A genre-defying offering from Strangemen & Co. written by, co-directed by, and starring James Ortiz, The Woodsman employs poetry, music, dance, and most memorably puppetry to give Dorothy’s tin companion the Wicked treatment, taking us from his parents’ romance through the moment the little girl from Kansas finds him rusted in the forest. After a lengthy (and, frankly, unnecessary) spoken prologue, the play entirely eschews dialogue in favor of sound and movement coordinated by Ortiz and co-director Claire Karpen to tell the story of the man who would be tin. After learning his wood-chopping trade from his proud father (Will Gallacher), flesh-and-blood Nick Chopper (played by Ortiz) falls in love with Nimmie (Eliza Simpson), a slave girl in the service of The Wicked Witch of the East (portrayed in flight by Alex J. Gould, and in all other scenes by the stunning combined performance of Amanda A. Lederer and Sophia Zukoski). The witch’s vengeance upon the lovers leads to Nick’s ultimate transformation into the man of tin, and the dissolution of his relationship. Were it not for our familiarity with what happens after Dorothy shows up, the show might be hopelessly bleak. But even if the show ended as a downer, it would be worth it just to spend an hour in the world Strangemen & Co. have created. 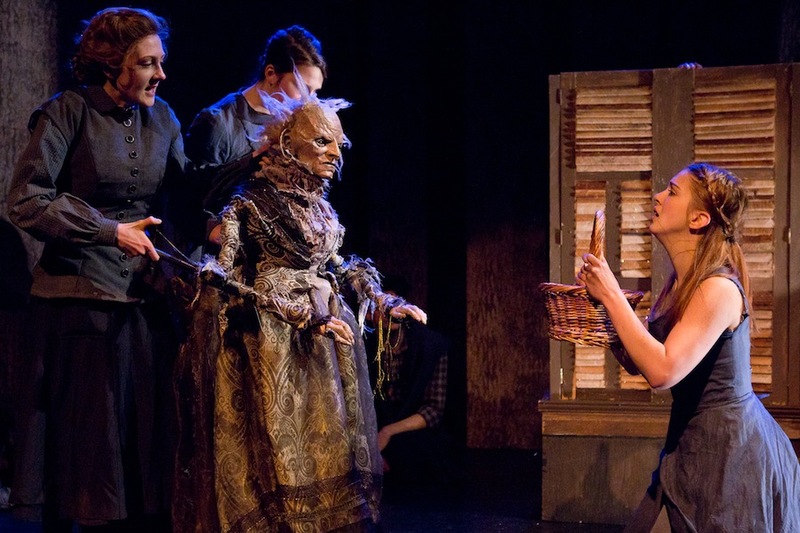 While the puppetry (which, like the set, is also the product of Ortiz) is the flashiest device employed – and besides the witch and the woodsman, you’ll be enchanted by the other creatures who populate the story, from the crows to the half-bear/half-tiger kalidahs – every element from the subtly suggestive lighting (by Catherine Clark) to the original score by Edward W. Hardy combines to transform 59E59’s tiny Theater B into Oz. Particular attention is paid to the soundscape created by the actors, suggesting everything from a creepy, dark forest to the onset of a rainstorm with sounds created by their breath, voices, and bodies. This is theater doing what theater does best – telling a story in a way that no other medium could, fully engaging the audience as creative co-conspirators by employing storytelling techniques that require the viewers to lean in and engage. By foreswearing dialogue in favor of movement, sounds, and (often wordless) song, the audience is forced to participate as interpretive partners, and the experience is all the richer for it. My only wish is that Ortiz would trust his technique and his company even more fully: the spoken prologue and the too-literal final song (lyrics by Jennifer Loring) diminish the purity of the experience, and in the case of the prologue, set up the wrong expectations for an evening that includes no other spoken passages. The Woodsman is at 59E59 Theaters through February 22, 2015.